Now that Bill Walton is back to analyzing college basketball following his foray into football commentary for the recent Clemson-Alabama national championship game, we need to hear from the gridiron expert of the Walton family. What were Bruce Walton’s thoughts on his “little” brother’s work? Bruce, who played in Super Bowl X for the Dallas Cowboys after a UCLA career as an All-Pac-8 and Academic All-American offensive lineman, didn’t watch Bill provide ESPN commentary while dressed as Uncle Sam. “Somebody sent me a picture,” Bruce recalled, “and I said, “Oh my god! Are you kidding me? Bill worked as part of the ESPN Voices that featured varying platforms on separate channels, but Bruce is old school. He preferred to settle into a comfortable chair and watch Chris Fowler provide play-by-play and Kirk Herbstreit offer his always insightful analysis. Bill sat with four other ESPN broadcasters in a setting designed to provide a living-room feel. College basketball analyst Jay Bilas, NFL analyst Keyshawn Johnson (Walton and Johnson threw a football back and forth across the set) and Sports Nation hosts Michelle Beadle and Marcellus Wiley wore casual living room attire typical for friends gathering before a TV. "My phone blew up," Bruce said. "People were sending me texts about what Bill had said. I'm thinking, 'He said, what!' "
Maybe Obama, a noted basketball fan, was listening. A week later before leaving office he commuted 330 non-violent drug sentences. Bruce understands why ESPN used Bill outside his bailiwick. Bruce, who knows a little about the broadcasting, offered ESPN some advice. After Bruce’s NFL career, he returned home to San Diego and went into the radio business. At one time he owned a San Diego radio station. Actually, if ESPN wanted Bill to stick to the script – and they probably don’t or they’d lose Bill’s unpredictable appeal – they could have Bruce in a radio booth posing as Bill while offering legitimate football analysis. Bruce and Bill were high school basketball teammates on championship teams at Helix High in suburban San Diego. Bruce, one year older, left for UCLA on a football scholarship before Bill joined him in Westwood to launch his basketball career. Bill is a Naismith Basketball Hall of Famer that won two NCAA titles and national player of the year awards at UCLA and two NBA titles and MVP awards with the Portland Trailblazers and Boston Celtics. So that brings us to asking, what was Bill doing in an Uncle Sam costume? It’s a simple answer: On a day of a national championship football game, he celebrated the freedom we enjoy in America to express our opinions. The irony for some older fans was they remember Bill was arrested in 1972 with other UCLA students protesting the Vietnam War. They expressed the opinions of many Americans opposed to the quagmire, but in those turbulent times, others that supported President Nixon’s war painted him with a broad brush as an unpatriotic radical. The arrest of an All-American basketball player drew special headlines and photos. Walton was bailed out of jail by his conservative UCLA coach, John Wooden. Wooden told Bill he disagreed with him but respected his right to express his opinion. Wooden suggested a better protest method was to write Nixon a letter. Bill did – as he tells the story in his book, “Back from the Dead” -- on Wooden’s UCLA stationary. That’s Bill Walton. But some people never forgave Walton for protesting. One was the late U.S. Navy Admiral Tom Hamilton. When he served on the San Diego Hall of Champions Board of Directors, I learned from other board members Hamilton blocked Walton’s selection to the San Diego Hall of Fame. An iconic figure such Walton is an automatic for his hometown Hall of Fame, but Walton wasn’t enshrined until Hamilton was no longer on the board three years after Walton retired. Previously, San Diego football icon Marcus Allen was inducted one year upon retirement and San Diego baseball icon Ted Williams while still playing with the Boston Red Sox. Hamilton understandably had conservative views on the war as a military man, but he’s the same Tom Hamilton that attempted behind-the-scenes maneuvering to invite Alabama’s segregated football team to the Rose Bowl in the 1961 season at the expense of an integrated Big Ten school. At the time, Hamilton was the commissioner of the AAWU (Pac-8). A loophole in the Rose Bowl contract opened the door to Hamilton to persuade Rose Bowl officials to invite Alabama and head coach Paul “Bear” Bryant, who served under Hamilton in World War II. But when UCLA’s black players got wind of it, they threatened to boycott playing against a segregated team. Once Los Angeles Times columnist Jim Murray, a Pulitzer Prize winner, wrote about it the Rose Bowl backed down. Minnesota, led by Sandy Stephens, the first black quarterback to lead his team to a national title in the 1960 season, represented the Big Ten. Stephens and the Gophers beat the Bruins, 21-3. Hamilton might have served in the all-white uniform of an Admiral, but Walton dressed as Uncle Sam represented America’s ideals of freedom for all better than Hamilton and Bryant, two men who at the very least tacitly approved of segregation in the South. It should be noted Walton works tirelessly to support the Challenged Athletes Foundation. Many of those athletes were severely wounded from the wars in Iraq and Afghanistan. 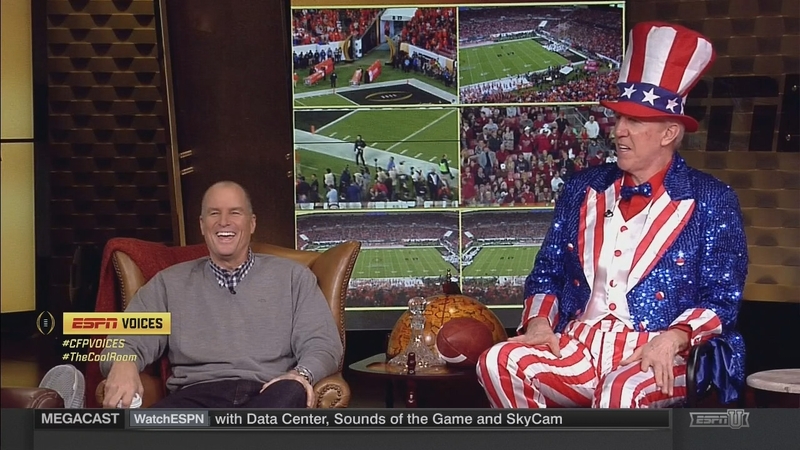 That’s the Bill Walton who was dressed as Uncle Sam, whether you think he contributed anything to ESPN’s football broadcast or not. NOTE: Research on Tom Hamilton and Bear Bryant and UCLA's threat to boycott the 1962 Rose Bowl was taken from my book, "Raye of Light." The book examines Michigan State's leading role in the integration of college football.